Adam Swetlik, a 2017 candidate for Boulder City Council, is the youngest candidate in this year’s race, and his concerns are very much in line with others in his generation who are not wealthy—with the high price of housing and growing inequality near the top of his list. “It’s getting harder and harder for low-and-middle-income people to stay in our city. A lot of people have to work 60 hours just to stay a member of the community, and I’m one of them. I think our Council needs better representation for those people, which is why I’m running,” said Swetlik, 29 years old for a little while longer. Swetlik is from Green Bay, Wisconsin, and lived there for the first 18 years of his life. He said Green Bay offered some of the same small-town environment as Boulder, and perhaps surprisingly for a city with a National Football League team, the population of Green Bay was just 104,057 in the 2010 census. He also noted that he grew up with the well known “traditional, hardworking, and just kind values” associated with life in the Midwest. He came to Colorado specifically to attend the University of Colorado Leeds School of Business, and graduated in four years with a Bachelor of Science degree in Marketing. While he values his academic education and said it gave him the tools he needed for his professional career, he believes his most formative college experience came through his time as a rower and coach with Colorado Crew, one of the largest club sports teams at CU. He was a rower for four years with Crew, two years as a captain, which meant early morning hard workouts at the Boulder Reservoir, along with additional workouts during the week. He then became a coach, but the Crew head coach left about a half-year into Swetlik’s first year of coaching—so he took over as the men’s head coach and stayed in that position for four years. “It taught me what being committed to a cause was really about, so that really gave me my values in college. I learned a lot through class, but I learned more about how to live my life through rowing,” said Swetlik. Swetlik is making his first run for elected office, but has kept up with local political news as a Boulder resident, and is certainly getting issue immersion through preparing for the many questionnaires and forums that come with the territory. This, of course, includes questions about housing and growth. He recently purchased a one-bedroom condo after renting for a number of years, and maintains that he wouldn’t be able to stay in Boulder if he had to keep renting, since the typical cost of rent far exceeds his monthly mortgage payment. Swetlik cited a recent study showing about 3.3 new jobs coming into Boulder County for every one housing unit since 2010, and said it’s an unsustainable ratio that’s driving housing prices to unaffordable levels for most potential low and middle-income residents. He said he generally supports Boulder’s current height limitations, but said he supports having “just a few options” open for buildings taller than current limits to help address the shortage of affordable housing. Swetlik believes future development ought to be prioritized to provide housing for people in the low and middle-income range, in part so more people can live near where they work—which can also factor into the city’s transportation challenges. “It starts with building full neighborhoods where you can meet the basic needs of a daily lifestyle—so that means having a corner grocery store, and city planning that will provide for people to not have to get in their cars to go across town,” said Swetlik. Swetlik supports Boulder’s efforts to establish a municipal electric utility, even after the early September ruling from the Public Utilities Commission, to help Boulder reach its established climate goals and to grasp local control. He emphasized that the muni gives Boulder the best chance to put its energy future in its own hands, as opposed to in the hands of Minneapolis-based Xcel Energy. Today, Swetlik’s primary job is as Product Marketing Manager for SparkFun Electronics, an online company that sells electronic components and posts online tutorials for people interested in learning more about electronics. He compared the retail component to RadioShack “before they started selling cell phones,” with its customers including hobbyists, tinkerers, electrical engineers, and startup companies interested in building their own products. And as a marketing manager, he believes he can take that talent and help the city do a better job of communicating what’s going on to the community. “I think it needs to be done with much better marketing then ‘right-sizing’ was rolled out with. Just getting community buy-in and telling them what the plan will be, and then rolling the plan out in a well thought out manner, is a priority for any major improvements,” said Swetlik. He also works part-time as a doorman at the Walrus Saloon in downtown Boulder, which he believes gives him a unique viewpoint into the sizable younger segment of local adult society. “Service industry jobs are what keep a lot of the members of this city employed. They are some of the hardest working and best people I have ever met…Also, I get to provide safety for the college students in Boulder. That is my main job, to make sure we maintain the safety of everyone who is a patron there, and those are mostly college students. So, it is a great way to interact with what is essentially a quarter of our community each year,” said Swetlik. By working in downtown Boulder, he notices some of the impacts of homelessness first-hand. He believes the city has a “moral obligation” to provide services for the homeless, but sees ways to improve on the city’s efforts such as providing more public restrooms, improving lighting on paths and trails for public safety, and expanding upon the “Ready to Work” program so more people can move into a more productive life and perhaps escape homelessness. 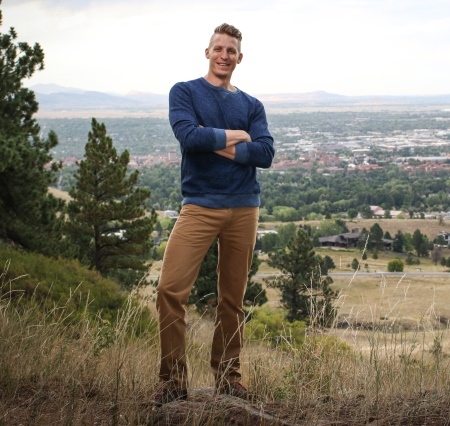 As a former renter and current homeowner who has spent much of his time in Boulder “just trying to make ends meet,” Swetlik hopes to provide votes and policy solutions to help other young individuals and families thrive in the special community he calls home. “My ultimate goal is just to reduce the inequality in the city and give the representation that is needed to do that, by having a different perspective than what we actually have had on City Council before,” said Swetlik. Next Topic: Gerstle: Will Boulder pay it forward or cash it in? I saw Adam at the Boulder Library forum a few weeks ago and was impressed with his sincerity and decency. Any candidate who speaks up for the homeless, who usually don’t vote, is a person with real “kind values,” not a panderer and power-seeker. Adam is about the average age in Boulder and representation for the young has been sorely lacking for the 39 years I’ve lived here. I’m voting for him.